Emory Medicine is the strategic alignment of Emory Healthcare and the Emory School of Medicine by which the entities deliver on the tripartite mission of patient care, research, and teaching to better serve our patients and learners. 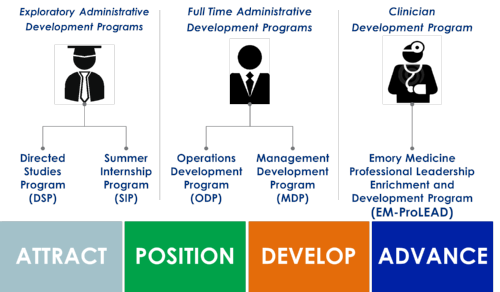 Through this alignment, the Emory Medicine Office of Development Programs endeavors to attract, position, develop and advance premier talent to be future leaders in academic health. As the largest, most comprehensive group practice in Georgia, Emory Clinic serves as the ideal environment to shape future leaders of health care. For over 60 years, Emory Clinic has been responsible for some of the most significant innovations and treatments in health care. The Clinic is comprised of 1,800 specialists, sub-specialists, and primary care physicians who care for patients across the clinics, hospitals, and affiliates of the greater Emory Healthcare Network. The Emory University School of Medicine is a leading institution with the highest standards in education, biomedical research, and patient care. We are committed to recruiting and developing a diverse group of students and innovative leaders in biomedical science, public health, medical education, and clinical care. We foster a culture that integrates leading edge basic, translational, and clinical research to further the ability to deliver quality health care, to predict illness and treat the sick, and to promote health of our patients and community.